Caitlin doesn’t see the world as others see it. She prefers black and white to color. She’s matter-of-fact and unemotional. She takes meanings very literally. She dislikes loud noises. And she hates when anyone invades her Personal Space. Caitlin has Asperger’s Syndrome. Kathryn Erskine has created a beautiful character and surrounded her with difficulty. Not only does Caitlin’s struggle with social graces make her an oddity in the fifth grade and leave her virtually friendless, her brother has recently died in a school shooting. Devon was the one who explained thing to her in ways she could understand. It was Devon who took the pains to make sure Caitlin was secure and unafraid. Devon helped her navigate a world she doesn’t fully understand. But now Devon is gone. Rachel asks (the other girls) if her face looks really bad and Emma says, Of course not. It looks totally fine. Rachel says, Really? She looks around and her eyes stop at me. …What? Her voice is soft and shaky. Does my face look bad? …I wonder how she knows that honesty is one of my skills. Yes, I say. It looks bad. It’s purple and puffy and really gross. Rachel starts crying and runs out of the room. …I try to say that purple is actually my favorite color but too many of the girls are yelling at me. My grandmother says that kind of stuff all the time. She says shake a leg when she wants you to hurry and perk up your ears when she wants you to listen and be a doll when she wants you to get her a glass of iced tea. Michael laughs too. Want to know my favorite thing she says? When she wants you to be patient she says…keep your pants on! I laugh too. Why would you take your pants off? I don’t know! He howls. In conclusion, Mockingbird brilliantly tackles some very difficult topics. It does so with depth and emotion and in a way totally appropriate for young readers. I’ve read several books this year that feature school shootings, and personally I was a little disappointed to see it yet again. However, Erskines ability to get inside Caitlyn’s head is phenomenal. 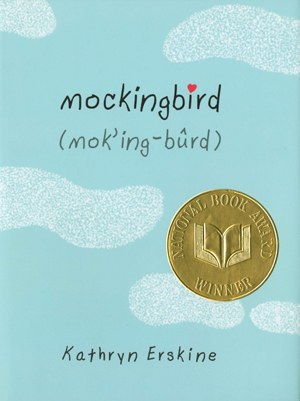 I recommend this National Book Award winner. I chose to read this one because I read your review, Erik! I didn’t like the school shooting, either. I think I would have killed her brother off another way. 🙂 But I loved the way Ms. Erskine gave us a glimpse inside Caitlin’s thought processes. It was eye-opening for me. When you said you’d kill the brother off another way reminded me of a quote someone sent me – “Be nice to writers or they’ll write you into a book and kill you off.” I forget who said it but it’s pretty funny! Thanks for the review, I’ve been thinking about reading this book. I read a great book from the sibling’s perspective and the daily challenges of trying to live a ‘normal’ life in “Rules” by Cynthia Lord. I’ll check that one out. I love getting personal recommendations like this, because they usually turn out well. 🙂 Thanks!